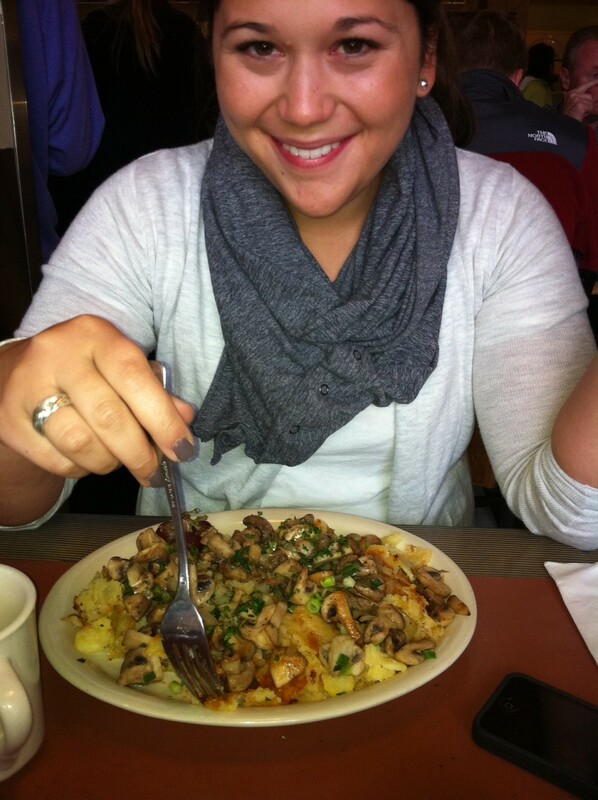 This Sunday I went to Helzer’s for brunch with my dear friend Marina. Good company and good food. It is a bit of a trek to Alberta from little old SW, but well worth it. My friend Marina is a vegan (yes, this means she can’t eat cheese… and meat too blah blah... but cheese!? what!?) and they had a couple options for her. I usually forget about the vegan thing until we get to a restaurant and the only thing she can order is the freaking hummus plate. But hey, I guess even a hippy dippy city like Portland struggles sometimes with the vegan friendly options. Helzer’s had some choices, as long as they were willing to make changes with the order… and they were! She ordered mushroom hash. It was all pretty and sautéed and garlicky delicious. I on the other hand, did not have a vegan friendly meal. Apparently I was feeling southwestern yesterday. 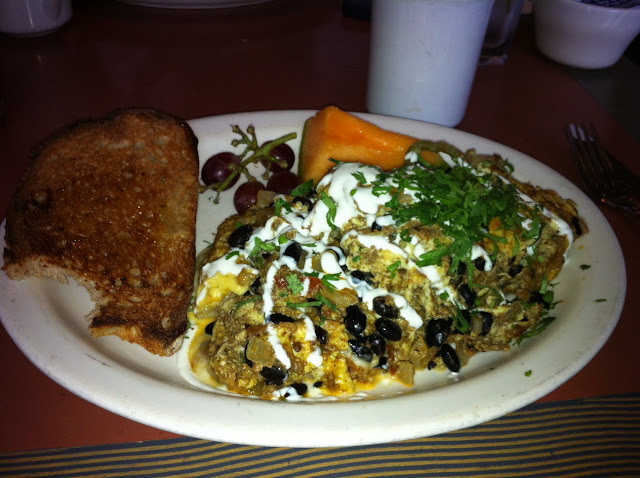 I had the black bean chili scramble. It was the guts of a breakfast burrito on a plate. Isn’t that usually the part we want anyway? It had the perfect amount of flavor and spice. Sorry about the crappy pictures. Note: missing bite from toast. I was just really hungry! Helzer’s is low key and understated. You feel instantly accepted when you are seated. No one is judging you. It feels like a family place. Possible thought process: I just want a good breakfast! Do I really need to put on a decent outfit? Decision: Let’s go to Helzer’s… nobody will judge. I am not saying that other places judge or that Helzer’s is scrubby. Some places just make you feel like you should have joined in on the trendy or the fancy of the place. Helzer’s is just comfy. I mean… all they're tryna do is feed you! A concept I greatly appreciate from a food service establishment. Why do so many restaurants think we are there for the ambiance? No dude. I ordered food 45 minutes ago for a reason! I am not here to soak in the atmosphere… (do you hear me McMenamins? I have been to many of your 1,000 locations. The ambience is the same everywhere/ where is my GD food!?). Enough ranting. Honestly, Helzer’s does not disappoint. They represent the NW with their fresh menu and welcoming environment. It isn’t the best breakfast in Portland, but we only waited for a few minutes and we left full and happy. No complaints. awesome post! Good company and good food. It is a bit of a trek to Alberta from little old SW, but well worth it. thanks for shring with us. I love hearing from you all! Your comments regularly make my day. Hanging out in the 21st century. Riding boots used strictly for walking. The best ship is friendship. No Mom! It isn't cool to get hot lunch this year.